I was always interested in history and history of science. My maternal grandfather Sri R. Vyasa Rao wrote Sri Krishna Caritra in Kannada (my mother tongue) based on Sri Bankima Chandra Chatterji's Bengali masterpiece of the same name. My study of the work taught me that there advantages to looking at history from a scientific point of view. I had long planned to bring out an English version of that work, which finally happened a few years ago in my English Search for the Historical Krishna. It is not a translation though but a new work that uses a lot of data which was not available to Sri Bankima Chandra. How did you learn the techniques required to do research in History? Do you consider your "non-training" in the colonial-Eurocentric approach to history an advantage? I don't think you need any special training in history except a capacity to look at all claims with skepticism and never to accept anything on authority or reputation. The same is true of science also. In that sense my training in mathematics (and math physics) prepared me well for history. It was important because it was an attempt by outsiders, even those hostile to us, to tell us how we should see ourselves and our heritage. Now that the Aryan myth, not just the theory is dead, we need to move to a new phase-- to understand what drove Europeans and even some Indians to hold on to it long after science and history had discredited it. European scholars like Leon Poliakov and Stefan Arvidson (in The Aryan Myth and Aryan Idols) have done it from a European perspective. Inferiority complex that is programmed into Indian humanities and social science programs. This is a colonial hangover or 'dhimmitude' towards their former masters. Colonialism may be dead but the mindset of the colonial subject is still there in the intelligentsia. This is by no means limited to India. I don't want to make too much of the vitriolic reactions of a handful of frustrated scholars -- both Western and Indian -- to the solution that Jha and I proposed. Several people, both in India and the West have received our work favorably and others have offered constructive criticisms. Actually the script doesn't tell us much more than we already know-- that the Harappan civilization was Vedic and also the Rig Veda came before Harappan archaeology (of the Indus Valley). THIS IS THE REAL ISSUE-- THE VEDIC-HARAPPAN IDENTITY. The rest is just diversion. Once this basic reality is accepted, it means the collapse of the academic discipline called Indo-European Studies. Unhappily, Jha died a few years ago but I and some of my colleagues are working on books on the subject. Now that these hostile academics and their followers have discredited themselves, we may bring out our books in the next few years. But for the desperate diversionary attacks by some scholars -- both Western and Indian -- worried about their positions and reputations, much of this work would have been available by now. So they succeeded in delaying progress by about a decade, that is all. My regret is that Jha, who made such a major contribution is no longer here to share it. Ignore their unsupported claims and demand that they give evidence and proof. Look at evidence without being swayed by prestige or reputation. Above all, don't give them any support-- financially or in terms of students. Their programs are dwindling, and it would be unwise for a young man or woman to try to make a career or gain fame following in their footsteps. For young readers, first, study the past but don't live in the past. See if we can bring ancient wisdom like Vadantic metaphysics to apply to problems of modern physics like quantum reality. Incidentally, this is my current area of interest. Next don't waste time studying nineteenth century ideas like Aryan and Dravidian, etc. They are dead, no matter what their advocates may claim. (They will also be dead.) Except for details we have pretty much solved the problem of Vedic and Harappan origins and their mutual relationship. So start looking at proto-Vedic and pre-Vedic ages. This will call for a thorough understanding of natural history from the Ice Age to the present and of population genetics. For everyone-- don't support these hostile programs just because they are at 'prestigious' universities or because some of these people have big reputations, at least according to themselves. Most of these are in decline and let them die a natural death. Don't prolong the agony by giving them any life support. 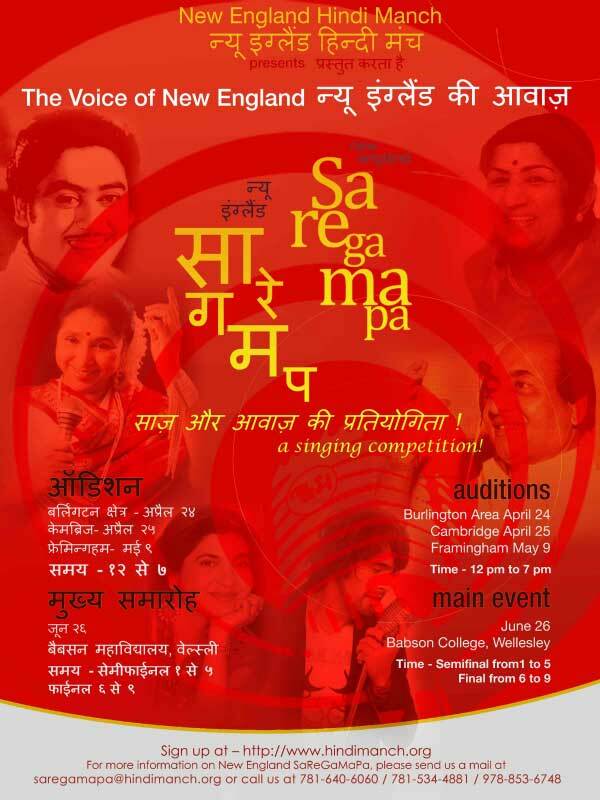 Sanjeevani, the chulbuli voice of 'Chorichori Jab Nazren Mili' and the first winner of Sa Re Ga Ma will be in the Boston area to enthrall you on May 2nd.